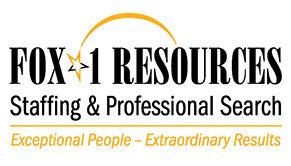 FOX-1 RESOURCES provides quality and professional employees, and outstanding customer service. We are recognized for helping organizations build winning teams through high performance recruiting. As an industry leader, we deliver solutions that exceed expectations every time, on time. Do you have Contract Staffing needs? – Staffing a special project? – Need to add staff quickly? – A key employee is out on sick time or vacation? – Have seasonal projects or fluctuating production needs? Our team provides a "boutique feel", but we have the resources you'd expect from a nationwide staffing firm.